Time to unveil Part 2 in the Changes series! If you missed Part 1 (Punch Cards), make sure you go back and read it! My boys are electronic junkies. Eh, who are we kidding – I love my computer and Nick loves his iPad, so I guess we fall into the category too. Anyway, the boys love playing the Wii, they love when they get the chance to play on Daddy’s iPad, they love watching Curious George each morning and something in the afternoon during quiet time, and a new recent “electronic love” is playing games on my old laptop. Junkies, I tell you! A thought occurred to me a couple of weeks ago: Seeing as the boys’ love their electronics so much, I wonder if they would behave better for the chance to watch or play more often. Hello, magical Screen Time tickets! Each of the boys gets 8 tickets on Monday morning. Any time someone is watching TV, playing the Wii, messing around on the old computer or playing on the iPad, I (or Nick) needs to be given a ticket. The microwave timer is then set for 30 minutes. At the end of 30 minutes they are given the option to turn the screen off or to give me another ticket. The boys share their Screen Time, meaning if someone gives me a card for TV time then someone else can use the same 30 minutes to play on the computer, or if all three of them are watching Curious George in the morning only one of them needs to hand over a ticket. I was a little concerned at first with the “sharing” like that, but it seems to be working beautifully! 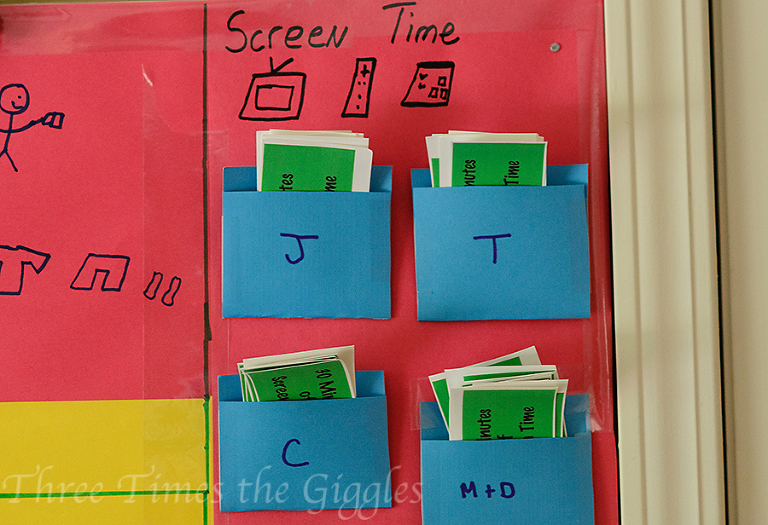 On the same chart as our Chore Punch Card jobs, is a corner for our Screen Time tickets. Each of the boys has a little envelope, and Nick and I have one. When a ticket is used, it gets put in the M&D (Mom and Dad) envelope, and when they earn one it gets put in their own envelope! How do they earn more? Hearing a great report from a teacher, camp director, babysitter, nursery worker, etc. “Listening in Public” was on their star charts, but as they began to care less and less about the star chart, they began to care less and less about behaving well in public. A few weeks ago, they were horrendous in a grocery store. Not whining and crying, but being wild! I could feel the stares and when we got to the car I cried. Yep. Good times! Public outings have been much better so far because they (Jackson especially) don’t want to lose a precious Screen Time ticket. I’ll say this, at the rate the boys were “spending” tickets last week I thought for sure we’d hit Friday and they would be all out of tickets. They buckled down though and earned just enough to last them through Sunday afternoon! 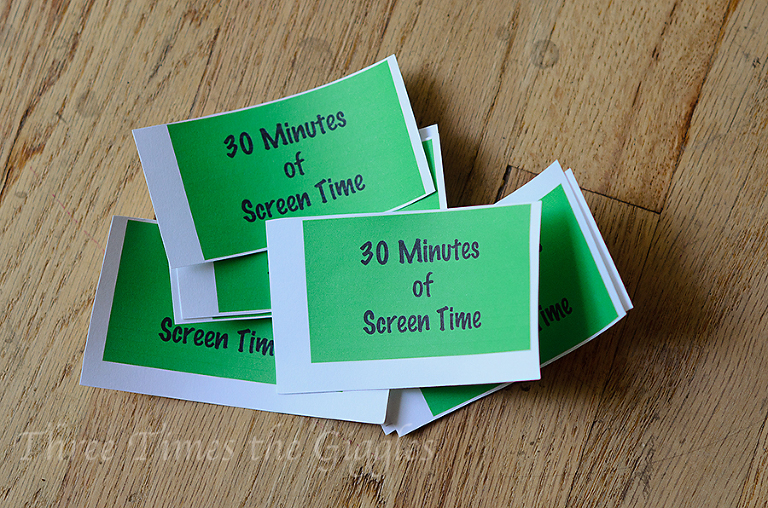 Want to give the Screen Time Tickets a try in your house? I have a PDF for you to download and print off! Just click through and save it to your computer!